There are several types of oils that are great for deep frying. In general, choose an oil that is free of impurities. Corn, peanut, soybean, canola, cottonseed and safflower oils work well for deep frying. Deep frying involves submerging a food in hot oil. The ideal temperature is around 176–190°C. During deep frying, heat and mass transfer in the product and product evolution are governed by heat transferred from oil to the product by its external surface. The impact of heating is related to the final reached temperature and to the rate of heating. The moisture inside the food turns into steam, cooking the food from the inside. The steam helps to keep the oil out of the food. If the temperature is too low, the oil will seep into the food, making it greasy. If the temperature is too high, food will dry and oxidize the oil. 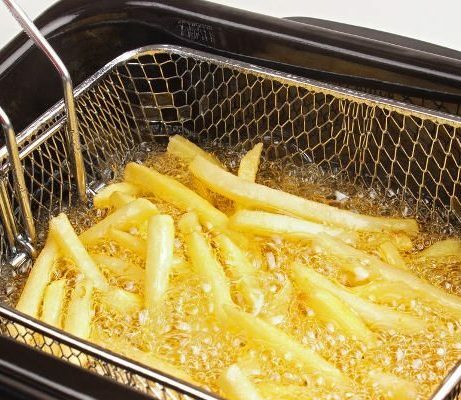 Autoxidation takes place at deep-frying temperatures, but hydroperoxides formed immediately decompose into primary and secondary decomposition products, which themselves are responsible for the flavor of oils use for deep frying and the resulting fried product. Deep frying uses a large volume of liquid with a high boiling point, such as oil, fat an paraffin, whose initial temperature is set significant above the boiling point of free water.